Fall Protection Basic Rescue - Western Canada Fire & First Aid Inc. This course includes both classroom and practical components to provide both the knowledge, and practical skills required to safely rescue a co-worker. The processes taught utilize a simple standardized rescue system, effective and efficient for fall protection rescue. 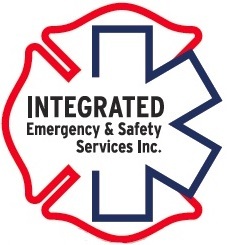 This course is provided through a partnership with Integrated Emergency & Safety Services Inc.
Any workplace that utilizes fall protection systems must ensure they have a means to quickly rescue a worker that is suspended from their harness, we can provide both the equipment and training to accomplish this. If you need assistance with your rescue plan or you are not sure what rescue equipment you need at your work site, let us provide you with assistance developing your rescue plan and providing you with your own affordable rescue equipment. We will ensure you have the correct equipment, training and procedures to meet OHS requirements. Workers who are readily available to execute a prompt retrieval of a suspended worker. Fall arrest systems are not complete without a rescue plan, as specified by OHS legislation. Relying on off-site rescue is often not in the best interests of the worker; being suspended in a harness can quickly have negative health effects. For more information on suspension trauma and the importance of this system and training click here. Note : This course exceeds Alberta OHS Code requirements, Part 7 Emergency Preparedness and Response and Part 9, Fall Protection Plan. Certification is valid for 2 years however annual renewal of training is recommended. Course Duration: 6-8 hours depending on class size. Includes instructor led classroom time and practical time. Note: Equipment costs are extra, contact our Director of Sales at 780-469-4887 for a quote on equipment and training packages.